Project: Photo wall | how 'bout some cake? Jason’s been away at a poker tournament since Wednesday which has allowed me to unleash a fury of organization on the condo. There are still a few boxes around, and the decorating has just begun, but it’s starting to feel like home. Downsizing has presented multiple challenges, one of which was where to put all our photos. 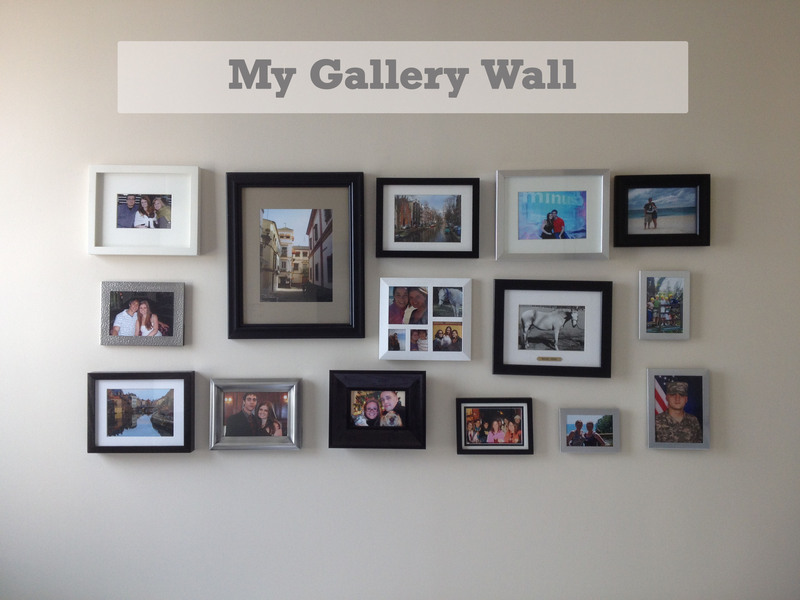 I’ve always wanted a gallery wall, but I’ve been intimidated by them. It’s so much measuring and many holes in the wall if you mess up and/or hate it! Well, yesterday I decided to go for it. And it wasn’t that bad. In fact, I’m pretty happy with the results. I started by gathering all the framed photos I wanted to use. I laid them all out on the bed below the wall, and reworked them until I liked the shape, spacing, and balance of the arrangement. Then I measured the arrangement and the wall. I marked the center of the wall, and then went 31″ in either direction to mark the ends (the arrangement was 62″ wide total). Using the depth of the arrangement, I measured where I wanted the bottom corners to be, and marked there, too. I hung the top left and right photos first. Knowing my ends, I hung the ones between. I did the bottom row next, and filled in the middle photos last. If I was going to go out and buy a bunch of frames for a gallery wall, I’d probably get ones that matched better. But that’s not what this project was about- it was about using what I had. I’m still working on getting them all straight, but overall, I dig the look. Verdict: Success! Love it! If you’re going eclectic, the more mismatching the photo frames the better. I did one last year, and I couldn’t figure out what was missing from my monochrome living room. I am now in the process of adding colored photo frames to it.. slowly but surely! Is yours free form, or square/rectangular like mine? I really like the free form ones (especially since I’m going to eclectic) but I thought this shape was a little safer for my first attempt. I tried for the free form look at first. But I am such a symmetrical person, I literally could not place the frames so they were asymmetrical. My mind wouldn’t let me! haha It wasn’t until I put it up on the wall that I realized how to make it better. More different sizes & more colors! You did a great job! I’m really enjoying your blog and living vicariously through your stories. Enjoy these days-they’ll hold great memories for you! I love it!!!! Such a great idea 🙂 You have definitely inspired me to try a gallery wall in my next apartment.